I was challenged at this time in my work to understand what this powerful dream was really offering me. It was one of a number of dreams in a series which seemed to move out into the world, connecting me in important ways to mysterious meanings which defied rational explanation. Twenty years later, deepening in my Jungian orientation through a seminar series with the analysts of the Santa Fe group, I came across Jung’s description of the serf’s predicament: “I am the serf who brings it and does not know what he carries in his hand. It would burn his hands if he did not place it where his master orders him to lay it” (Jung, Red Book, 2009, p. 230). Furthermore, from this perspective, Jung observed “To understand a thing is a bridge and a possibility of returning to the path. But to explain a thing is arbitrary and even murder…” (Jung, Red Book 2009, p. 229-230). While I was enjoying a newfound sense of freedom from my compulsion to explain and contemplating on magnificence and force together, this 1994 dream and these illustrations came to mind: might they be an example of image and force in one, magnificence and force together? This image, suggesting we have somehow been knocked out of the boat, brings forward earlier references to the impact on psyche of episodes of trauma and emotional/physical overwhelm. What I am signifying as wounds of overwhelm. These human experiences have been described as the psychological basis for the mythological motif of death and rebirth. From Egyptian mythology, Edward Edinger has observed: “When the child Maneros witnessed Isis’ terrible loss and grief upon seeing the dead Osiris, this awesome sight was so intolerable to Maneros that he fell out of the boat and drowned.” We too are vulnerable to losing balance, falling overboard and drowning in the face of intense emotion. It is how we are wired. From the conceptualization of the ego-Self axis, such wounds symbolically knock the 110 voltage wired ego temporarily out of the boat of consciousness, and drop down into the deep waters of total psyche, in the realm of the Self. Here, they remain as if in suspended animation until the conditions are favorable for their re-integration. These are the original encapsulated episodic memories which form the nuclei of our complexes. On a side note “suspended” is misleading in terms of these are not energetically inert bundles of split off trauma. Their energies are not diminished by time and space. Depth work is about helping us to get back into the boat with a new relationship to the reality of the waters of the unconscious, the unseen world. It is about discovering a way to re-connecting to those very experiences which, for our survival at the time, necessitated the disconnect. Getting back into the boat consciously means choosing to open one’s self to suffering directly the images and affects generated by the original wounding experience. By definition, when these wounds of overwhelm are sufficient to knock the ego out of the boat and into the unconscious, the wounding itself evokes archetypal energies via a match with its associated collective, primordial scene. The ego is challenged to bring such scenes back into consciousness. After a long opening night, hearing a hundred personal stories about first confrontations with death, I shared mine, and was then afforded a week in deepening in that exploration. While I had never forgotten the details of my own near actual drowning experience, I was able to see then, 30 plus years later, how intensely overwhelming that confrontation with death was for me; how it had changed me, and how it was present in my work at that time, and informs me today. The short story is that I recognized then my intense interest and evolving skill in helping others who required hospitalization in an acute psychiatric inpatient ward, could be seen as a reflection of my own initiatory encounter with death. Recognizing this possibility for the first time, a “name” came to me spontaneously: I was He-Who-Talks-About-Deep–Over-There. I was able to connect the intensity of my interest, dedication, and seemingly inexplicable capacity to sit with the most psychotic, anxious, depressed, and overwhelming experiences of others, my deeply felt resonance with the mystery present in primary process, the non-ego realm, to my ego’s efforts to look out, not within me. 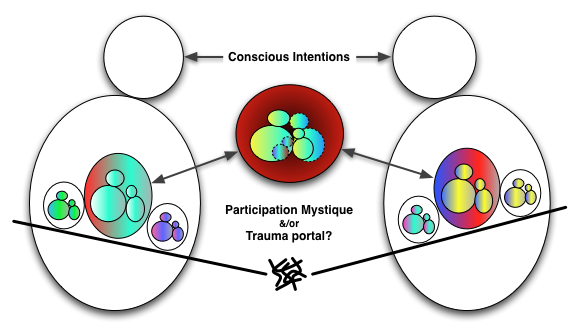 My connection with the depths, though largely unconscious to me at the time, was providing some critically important glue in my ability to trust the meaning of the dynamics present in the patient’s compensation-decompensation-recompensation cycle . While we may not be able to understand it yet, it can be understood from a drive to healing perspective; it is not accurate or helpful to reduce the action to evidence of pathology. It is psyche attempting some form of corrective adjustment. This focus on the other enabled me to be present with this level of experience in the unique energetic field of the inpatient setting, without opening to my own terror and anxiety associated with my encapsulated trauma. This would be an aspect of my partial cure adaptation. My work with inpatients was about supporting them in finding their way back. Back into the boat. I am pulling together the story about what happened next. It is a bit unusual in that the actual sequence of events have a strikingly mythological, dream time quality. During that week I realized I needed to find a way to revisit and complete the initiatory cycle. The thought occurred to me, if/when I was able to do so, what might my new name be? What came to me at the time was: He-Who-Talks-About-Deep-In-Here-Now. While I do work out of a talking cure modality, I would place the emphasis today on being present with the full range of emotion. Something like One-Who-Is-Fully-Present-Inner-Outer-Above-Below. What do you think? Should we practice being fully present? I believe so. Let us make preparations together to get back into the boat of consciousness, the place of re-membering.